Everybody Has One and It’s Time To Use It! Yes, everyone has an opinion. However, that is not what is being inferred with the title. This article is referencing the fact that everybody has a diaphragm. Yes, the diaphragm. A skeletal muscle connected to the entire circumference of the ribcage and several of the lumbar vertebrate. Its chief function is to lead the breathing process of the body. 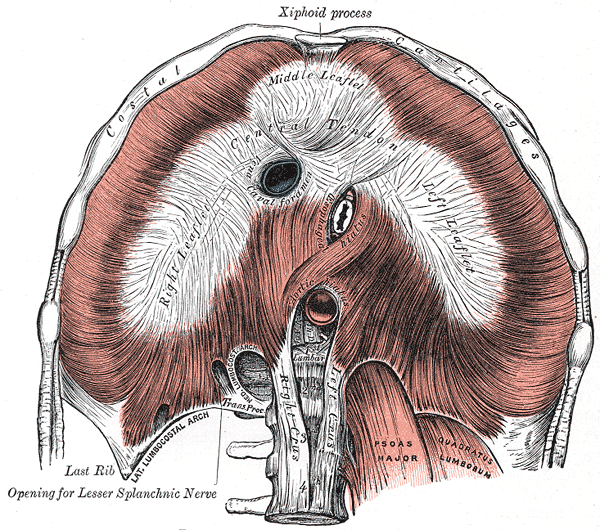 The diaphragm is a voluntary muscle. Simply put, if not used on a consistent basis, this muscle becomes weak. If the diaphragm is tight and weak from lack of proper use, it will hinder the function of the psoas. To illustrate this conundrum, tightly squeeze the top of a bicep (acting as the psoas) with your opposite hand (acting as the diaphragm), flex the arm a couple of times, noting the restriction of movement. Now relax the grip and flex the bicep again. There will be a considerable difference in movement, demonstrating how muscles with different jobs can profoundly affect each other. Over time, this imbalance in the lumbar region can lead a chronic pain pattern. If the psoas becomes tight and weakened due to injury or lack of proper use, it will affect the diaphragm through inflammation, ultimately restricting breath – supporting the pain, spasm, pain cycle. Inflammation of the muscles attaching to the lumbar vertebrae constricts the nervous tissue responsible for providing energy to the lower body, decreasing blood flow/oxygen available to the spastic tissue. This constriction manifests as pain and dysfunction. Diaphragmatically (belly) breathing relaxes the diaphragm, reduces the pressure placed on the psoas muscles, increases circulation and blood/oxygen levels, and ultimately maintains balance of the abdominal and lumbar region. Compression of the vagus will trigger a fight or flight response. The brain senses there is something wrong with the body when this occurs. The vagus nerve descends off the brain, directly behind the large neck muscles, attaching to the esophagus, and travels through the diaphragm to the abdominal cavity. Chest/shallow breathing constricts the vagus at the neck and diaphragm. When the brain senses the constriction the adrenals are brought into play to assist the body get out of its present predicament. If the brain senses the body to be moving during the restricted breathing/vagal impingement, it will sense the body it attempting to move away from danger and adrenalin will be the primary hormone produced by the adrenals to assist in this function. If the body is sedentary during the same scenario, the brain will sense the body is ill or injured, and the adrenals will primarily produce coritsol. The function of cortisol it to mobilize fat stores for energy (the body is ill or injured and food is not available) so the body does not use vital muscle tissue for energy. Even though humanity inhabits a universal, human form, the human form is very much misunderstood by humanity. The diaphragm is the primary respiratory muscle which DIRECTLY affects every system of the body. Not properly utilizing this muscle leads to small imbalances, leaving the body susceptible to a myriad of pathologies, and leading to more serious conditions . Use your free time to learn more about how your body works, freeing up more time to enjoy how your body works. Stop, BREATHE, and BE! Summer is upon us and it is time to enjoy the great outdoors! For many, camping, hiking, and experiencing what nature has to offer are typical summertime activities. Most people are aware of the inherent risks of overexposure to the sun, dehydration, and protecting oneself from venomous creatures, and biting and stinging insects. For the latter, awareness of surroundings and the use of insect repellant are essential. Summertime is also a prime time for humans to become host to ticks. Tick bites, while usually innocuous, can become debilitating if bitten by a deer tick (or blacklegged tick, Ixodes scapularis) carrying the bacterium responsible for Lyme disease, Borrelia burgdorferi. 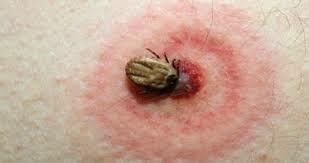 The tick must be attached to its host for 36-48 hours or more in order to transmit the bacterium. A tell-tale symptom of Lyme disease infection may or may not include a red, expanding rash called erythema migrans (EM). 70-80% of infected persons show signs of a rash, beginning at the tick bite, 3-30 days after being bitten. Rarely itchy or sensitive, the rash may be warm to the touch. Erythema Migrans lesions may on any area of the body. Other symptoms 3-30 days post tick bite may include headache, fever, chills, fatigue, muscle and joint aches, and swollen lymph nodes. An untreated Borrelia burgdorferi infection may spread throughout the body producing specific symptoms that may come and go. Symptoms include severe neck stiffness and headaches due to meningitis, pain and swelling in the large joints, Bell’s palsy (partial paralysis of the facial muscles), additional EM lesions on other parts of the body, heart palpitations, vertigo, chronic fatigue, and fibromyalgia. Long term infection of the Borrelia burgdorferi bacterium may lead to further neurological complaints such as shooting pains and peripheral neuralgia (numbness in the hands and feet), arthritis accompanied by severe pain and swelling (particularly in the knees), chronic fatigue, and memory loss. Lyme disease is the most commonly reported vector borne illness in the United States. 94% of all cases reported in 2010 were in the following states: Connecticut, Delaware, Maine, Maryland, Massachusetts, Minnesota, New Jersey, New Hampshire, New York, Pennsylvania, Virginia, and Wisconsin. Several years ago I had a client with the chief complaint of chronic neck stiffness and peripheral neuralgia. The symptoms had persisted for over 10 years, with a variety of diagnosis provided by health professionals. One such diagnosis was Thoracic Outlet Syndrome (TOS), made by doctors at an unnamed University Medical Center. My client was convinced TOS was a rare musculoskeletal condition and removal of a neck muscle (scalenus anterior) would relieve her symptoms. Although some relief was achieved, symptoms continued to persist after time. Discouraged but not defeated, she hired a new doctor. Upon review of her history, the doctor noticed she was originally from Connecticut, leading to a round of questions regarding outdoor habits in CT, and if she had ever experienced the initial symptoms of Lyme disease. As it turned out, she loves the outdoors and had experienced the initial symptoms (sans EM lesions) while in Connecticut 10 years prior. A blood test confirmed a chronic Borrelia burgdorferi infection. Treatment with antibiotics is now the correct course of action. If you suffer from chronic symptoms aforementioned, and have visited or previously lived in a high risk geographical area for Lyme disease, it is entirely possible you may be suffering from a chronic Borrelia burgdorferi infection. Laboratory tests may confirm the infection and put you on the road to recovery. Have fun this summer and be safe. Stop, Breathe, and Be Well!